War is being redefined. It's no longer exclusively nation vs. nation with tanks and big guns firing at each other across a battlefield. It's being fought by groups looking for what's known as "soft targets," usually innocent victims going about their business without much of a care in the world. These innocent victims are being terrorized. Once they're hit, they live in mortal fear. Hence, the term "terrorist." The Islamic State has emerged as the world's leading terrorist organization. ISIS, or ISIL, or Daesch, or whatever you want to call them, these terrorists are proficient at what they do. What's more, they're in it for the long haul. Perhaps "the duration" is a useful term once again to describe just how long we must remain committed to fighting a relentless a resourceful enemy. 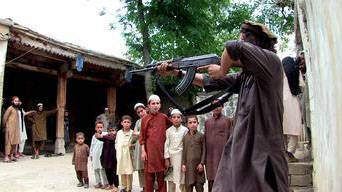 "ISIS in Afghanistan" tells how ISIS is recruiting children to its cause. The apparent success that ISIS is having in that war-ravaged land suggest to at least one commenter in the program that the war is likely to go on "forever." Well, forever is a long time. The children who are learning the "lessons" that ISIS veterans teach them are being filled with the kind of hatred that ISIS is bringing to its fight against the world. We saw the attacks in Paris, which have energized the powerful French military apparatus into striking back -- hard -- at the organization that took responsibility for the coordinated attacks that killed 130 people on Nov. 13. Can we expect more of this? Will today's ISIS recruits -- the children who are being taught to fire assault rifles and indoctrinated into the "glory" of strapping explosives to their chest -- be carrying out these assault when they come of age? "Frontline," depicting graphic and violent images in its special, suggests we can expect much more of the same. Oh, and in Pakistan, the Taliban are engaging in their own brand of terror. A second part of the "Frontline" broadcast examines the Taliban's efforts to reassert itself -- also through the use of murder and fear. Some in our government -- namely in the Obama administration -- do not want to hang the "terrorist" label on the Taliban, which many Americans believe is a huge mistake. "The Taliban Hunters" follows a Karachi police unit that is hunting the Taliban, which seeks to terrorize the citizenry with crime and what "Frontline" calls "target assassinations." That sounds like a terrorist organization to me. So the fight goes on. Yes, it looks like this war is going to be with us for a while.